The joke is, in both strips everyone involved feels something rumbling. I dunno, there’s a good chance the arrow on the box will end up smashed through by someone’s head, so we’ll never know. 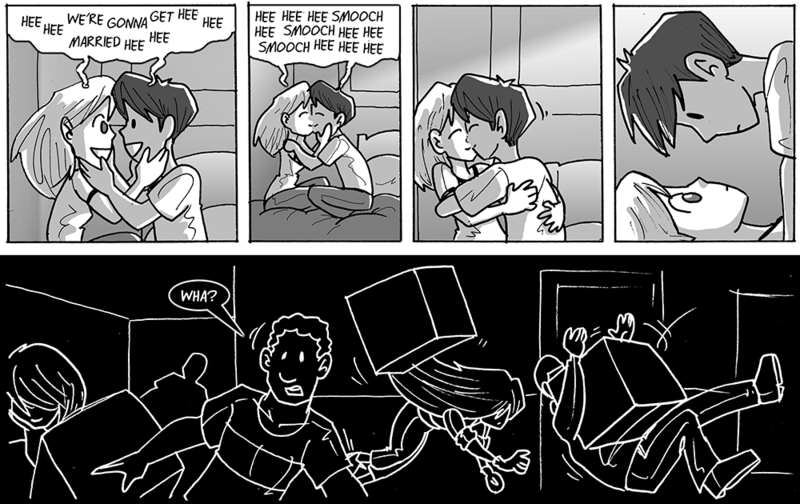 Also, I can’t help but imagine that Joyce and Walky are actually saying “smooch smooch smooch” in panel two, and it may actually make me hate them more than the chicken ring did. You never know, maybe the box will land facing sideways. Oh! No, I get it! It wasn’t a flashback it was the Independence Day-style ‘giant alien ship makes the ground shake from its’ engine noise’ trope. As for Walky and Joyce, they aren’t noticing because they’re busy making the earth move for each other! What? Did you miss Willis’ comment from yesterday? The events in the two narratives are not happening at the same time! The lower comic is Walky’s vision from the future. Stop, you two! Can’t you see your hanky-panky is causing the very fabric of the universe to shake to pieces?